Marquette’s starting five are an unusual group in that the sum of their individual %Shots falls far short of 100%. We believe this starting lineup puts the team and senior Jamil Wilson at a considerable offensive disadvantage. We’ll get to a suggestion to remedy the issue, but first some background information. The following circle lists the year-to-date %Shots (per KenPom.com) for each of the starting MU players. The shortfall to 100% is labeled “BAD! – 10.6%”. 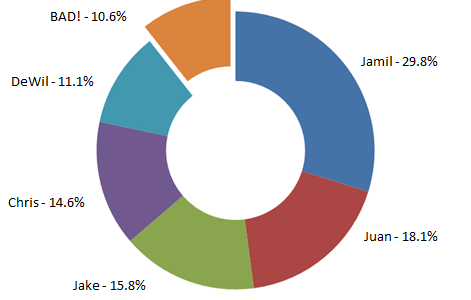 When he’s at his best, fans want Jamil to be more aggressive and believe he doesn’t take enough initiative offensively. The fact is his %Shots of 29.8% is the highest of any player in the Buzz era since Lazar Hayward in 2009-10. Jamil is shooting the ball plenty. The type of shots, partly due to his supporting cast at times, is an issue. Of the other four starters, none of their %Shots are unreasonable. An argument that Chris Otule’s figure should be in the upper teens might be reasonable, but none of the other four are 20%+ %Shots type players. That said, MU’s starting five has Jamil at almost 30% %Shots and the others at about where they should be… but there’s another 10.6% to be claimed. Starting each game with this lineup on the court is asking for guys to play less efficiently than they normally would. It’s true the substitutions often come early, but we can’t find a compelling reason to stick with the current starting lineup (from a numbers perspective; we fully understand and appreciate that Buzz & staff have reasons for much of what they do). If you could swap one bench player for one starter, who would it be? For us the answer is easy. Replacing Chris with Davante would help your offense, but we like Otule’s defense and the familiarity both players have with their respective roles (i.e., starting vs. coming off the bench). We believe the optimal change would be adding Todd Mayo to the starting group. At 23.4% %Shots (23.9% a year ago), Todd adds another offensive weapon to play with Jamil. Mayo is also by far the best guard/wing at drawing fouls and getting to the line. This doesn’t mean there’s no role for Jake Thomas. He’s a legitimate 3-point threat, but he’s better used with others – for example, with Davante Gardner – than in the current starting lineup. According to LNH’s research, after his first 3-point field goal this season came unassisted, Jake Thomas has received help on every made trey since. After point guard Derrick Wilson’s team-high 9 assists to Jake, who is number two in assisting Thomas on made 3-pointers? Senior Davante Gardner. Is the 89.4% %Shots of Marquette’s starters really that unusual? How about having only one 20%+ %Shots player in the starting lineup? Let’s take a look at some of the competition in the Big East. Team %Shots Only 1 20%+? Marquette isn’t far off from being a very good team, but the starting lineup should be altered.